Don't miss out on a great vacation in this beautiful beachfront home. Hilton Head Island generally has gorgeous weather year around. This property is booking fast for Summer 2019. This is a remarkable house and the summer months book fast. This house also has great deals for fall and winter weeks. Please check our calendar for availability before calling. This lovely elevated three story oceanfront home located in Palmetto Dunes features six bedrooms and five and half baths. During the day your family will enjoy the large heated* pool with adjoining hot tub located on the deck just off the living room which has been landscaped for optimum privacy. The large living room and dining room combination have soaring ceilings and windows providing magnificent views of the pool and ocean. The kitchen has been recently renovated and has beautiful granite counter tops,features an island for your convenience and is fully equipped. The bedroom on the first floor has a king bed and has direct access to the pool deck. Two sets of bunk beds are located in the pool table room providing extra sleeping space - perfect for teens or kids. Two gorgeous sweeping staircases lead to the second floor landing which has a cozy sitting area. You will find the master bedroom on this level. It is beautifully decorated and features a king size pillow top bed and a large master bath with a shower and separate tub. The master also has a wonderful private balcony which has beautiful views of the beach and the Atlantic. There is also another master bedroom on this level which features a king pillow top bed, private bath and an oceanfront balcony. The third level of this spacious home features the best views of the ocean yet. There is a large party room equipped with a wet bar that opens onto a large deck with panoramic views of the ocean. The fifth and sixth bedrooms are located on this floor. One bedroom has a queen bed and the other has two twins. Both feature private baths and dormer style window seats. All of the bedrooms have flat screen LCD TV's and DVD's. Palmetto Dunes has so much to offer from bike trails, canoeing, restaurants, fishing, golfing, tennis to just relaxing. This house is equipped with lots of extras that help make your vacation perfect. The house is professionally managed so there is someone on the island to handle any problems 24/7. Come and spend a week or a month and enjoy what this magnificent home and Hilton Head has to offer. Welcome to your own private piece of paradise! If this does not meet your needs or budget, check out our other oceanfront 5 bedroom homes located on North Forest Beach. The VRBO numbers are 69984 and 69057. Keywords: SPACIOUS, COMFORTABLE OCEANFRONT HOME WITH MANY BALCONIES. BEST AMENITIES PACKAGE ON THE ISLAND. After visiting the Island since 1983 I knew this was where i wanted to retire and have never regretted it. This paradise island has got everything i needed for a casual life experience. We pride ourselves on making this the easiest rental home vacation you have ever experienced with just about everything you need to enjoy the house already there. If you have any problem at all, one phone call is all it takes to get fixed. This amazing property has been hosting extended families since 1995 with many guests establishing family traditions and returning year after year. Call me and ask me why. 8 chaise lounges and multiple other seating options around the pool. 54 holes within gated community additional fee. DSL with wireless router, *Pool heated for an additional fee, free laundry and kitchen detergents, bottled water,premium coffee program and welcome bottle of champagne. Flat screen LCD tv's in every room. 8 bicycles provided for guests. free daily newspaper delivered. Free long distance telephone service, 8 beach chairs, 15 beach towels, shampoo, conditioner and qtips in all bathrooms, flashlights, batteries, first aid kit and much much more. We had a fantastic family vacation spanning 3 generations, 4 families and one dog. The house and location was everything we hoped it would be. So nice to have everything supplied. Complete stress free vacation relaxing in the heated pool and walking the beach. Jesse was extremely responsive to all emails even though we really had no issues. I look forward to repeating! Our family of six adults and five children (ages 4-14) spent a great week at 9 Dinghy Lane. Jesse and Marc were tremendous hosts and worked diligently to make sure everything we needed was accommodated. They provide beach towels, chairs, games etc. It’s the first time we have rented where we didn’t need to buy staples such as toilet paper, aluminum foil, napkins, paper towels, paper plates etc. Even coffee was provided. Even when the pool heater didn’t function as expected, Jesse and Marc were right on it to get it corrected. The bikes provided (18 of them, I counted) were a cost savings although several of them needed a little air in the tires and grease on the chain. Overall we were greatly satisfied with this rental and I would like to thank Jesse for prompt responses to our text message questions, and Marc for his quick actions on those minor issues. You are tremendous owners and hosts! The house is beautiful and in a perfect location. This was our second year at this fine home. The Palmetto Dunes area has become the best on Hilton Head. You don't need to leave this area unless you want to explore the many fantastic restaurants on the island. Renters of homes in this community should take advantage of the free Palmetto Dunes "Dunes Buggy" service which will take you anywhere in Palmetto Dunes or across 278 to the Shelter Cove area. Or just hop on a bike that they provide you at this home eliminating the need to rent one. 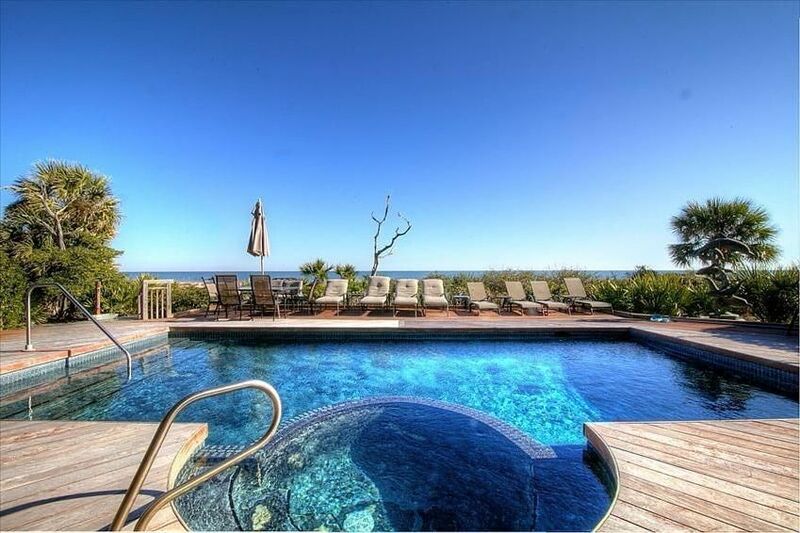 This amazing home affords views of the sunrise, ocean, eagles and ospreys for a relaxing get away. The reason you should consider this home is because of the management style of the owner. They provide everything. No need to run to the store when you get in. Order food delivered to your home or call Kroger at Shelter Cove who will deliver your groceries to your home. Jesse the manager lives nearby and provides off the chart customer service for your vacation enjoyment. You won't receive this level of individual attention anywhere else. What a great spot for a family vacation!!! This is the real deal. One of the very best locations in HHI...amazing views and super access to the ocean. The home served my large family well and everyone thoroughly enjoyed themselves. Marc and Jesse Chary are top-notch hosts and made sure everything was perfect. Outstanding hospitality delivered to perfection. Highly recommended. Marc and Jesse made sure everything was as it should be. $100.00 at time of booking, 10% of rental rate -$100.00 on 1/1/17 and the balance 60 days prior to arrival.